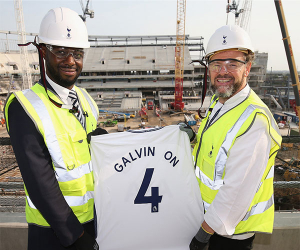 If you've travelled to N17 lately, you might have noticed something big happening: Tottenham Hostpur's grand old stadium, White Hart Lane, is a pile of rubble, and the skeleton of a brand-new, bigger and more illustrious ground is rising from its ashes. As a club growing in global appeal and with football’s audience expanding all the time, the club’s ownership sensed an opportunity to make a mark on the food offering, and has followed up the unveiling of three generations of the Roux family by swooping to sign three more chefs: lifelong Tottenham fan Chris Galvin, Bryn Williams, and Dipna Anand. The chefs will all take turns cooking at The H Club, the restaurant of the club's On Four hospitality complex, meaning that you can trade in a half-time balti pie for a multi-course, fine-dining-style banquet before the game, with a Chef’s Table and Player’s Table, too. We caught up with Galvin, to ask him how he felt about being signed by the club he loves, how his involvement will work, and his thoughts on football's changing audience. We were approached by Levy Restaurants about nine months ago. I've not said this too loudly, but I jumped at the chance and I would've probably done it for nothing. I've been told by Bryn not to say that. 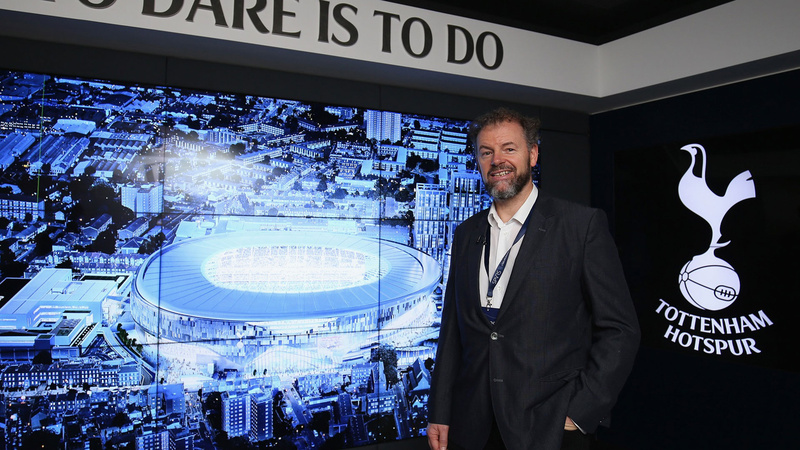 I've been a lifelong Spurs fan through the good and bad years, and when I first come in and saw the VR [the virtual reality preview of the new stadium], the hairs went up on my arm and I just couldn't believe it. And along with the recent results against Real Madrid – I never thought I'd live to see this sort of thing. So to be able to bring my other love, cooking, into the stadium? That's it, I'm done in life. It's all I ever dreamt of. How does it feel to finally become involved with the club at a time when it's going through such an upswing? I just I feel incredibly fortunate. Life's all about timing it's something I've never done before and something I probably wouldn't have done with and another club, to be honest. I've look from afar, because I love football anyway, and I've always been interested in what goes on in terms of cooking at football grounds – I've got friends that cook up at Newcastle and Liverpool; Gary Rhodes was at Man United – and it's something I often thought about. I thought about whether it would it be difficult getting the right ingredients, with the right equipment, and the right staff, because there are so many elements that go into delivering good food. But now it's much more experiential. There's a lot more dwell time at a game, and people are arriving earlier, staying later if the result goes the right way. When we put our restaurant on top of the Park Lane Hilton, we had to compete with this stunning view across London. You look down into the back garden of Buckingham Palace, you can see Windsor Castle. And over the 11 years or so that we've been there we've watched the City of London grow up and we've watched St Paul's disappear from the skyline it's buried now. And so one of our biggest jobs there was not to compete with it, but to sit alongside that wonderful view. And of course now at Tottenham Hotspur, at The H Club and On Four, the view... The first time you walk in there, I've got to tell you, the hairs will go up on your arm. It's a fantastic, world-beating stadium, and the rake of the ground is such that you're next to the pitch, no matter what floor you're on, even on the top, you're right on top of the action. So we were talking about how competitive we'll be with the Roux family, with Bryn, with Dibna. Chefs are naturally competitive – you're only as good as your last plate. But now we've got a brilliant team. People come to watch football, they're coming to experience the the atmosphere in the ground. It's a huge challenge to be able to deliver on that level, and it's something that really excites me. Is it a mark of Tottenham Hotspur's global appeal, with the chefs cooking at such a high level? It's a much-used expression, "exceeding the customer's expectations," but I think getting off at the station or being dropped off nearby, just the sight of the ground raises the bar. I was driving on the 406, I hadn't been on there for a long while, and on the flyover it looked like the Roman Coliseum rising out of the ground. It's just going to be very, very special. And just to be part of that, I feel very blessed. Did the fact the stadium is still in construction influence your decision to get involved? Does it feel like the restaurant spaces will be designed specifically for you and the other chefs? I have a shelf in our head office of projects that we've said no to, and that's always been important to me. When I worked for Corbin & King they always talked about having these two questions: 'could we?' and 'should we?' 'Could we?' is where your chest puffs up and you think 'I could do that', 'we can deliver'. But then you must always follow up with the next question, 'should we?' and ask why you're doing it. So it's often when I get to the 'should we? ', that we turn down lots and lots. I've kept most of the concepts that we've moved along but then decided they weren't right for us to do. But just talking to the guys at Tottenham Hotspur, I couldn't believe it: when we talked about ingredients, when we talked about equipment, when we talked about the team, when we talked about the aspiration for the food, and especially the technology. The guys are really forward-thinking about delivering the highest standard. And for cold rainy Wednesday nights when fans traditionally struggle to get out of work and get to the ground and want to eat quickly, we still need to over-deliver – there still needs to be quality. We need to work fast, but quality shouldn't suffer. Everything I looked at from the production kitchen to the areas we're going to be cooking in was first-class, and I haven't seen that for a long while, in hotels or restaurants, let alone a stadium. Do you think the project will open people's eyes as to what you can do with food not just in football, but in hospitality and sports generally? I think it's going to be a game-changer. I think it's going to be a hallmark of quality. I can't believe I'm saying all of this about Tottenham Hotspur, but I think it's going to be something that people want to copy and replicate, and it's going to take them a long time to catch up and beat it. So I think it's going to be the envy of a lot of clubs around the world. Do you think the audience for football is changing? Is there a worry about the 'prawn sandwich brigade' tag? I love all sports. I love Formula One, tennis, golf and I've seen at every single sport that the offering has been upped, with some brilliant chefs involved. I remember for my fiftieth birthday, my brother bought me a ticket for the Italian Grand Prix in Milan. It rained for three days, it was pretty miserable, but one of his friends was a chef for McLaren, and we got into the pits via the kitchens, and we met all the chefs. I was just gobsmacked when we went into the Ferrari hospitality area: the kitchens were unbelievable, they were Michelin-star level. If you go to Wimbledon you've got some brilliant chefs cooking there. You can get restaurant-quality food throughout. But I'm often on the terraces, so I was particularly proud of the salt beef sandwiches at Tottenham. They're quality, with good-quality sourdough. People should expect more; we shouldn't put up with the dismal offering that's at most grounds. I do think through media, through people that are educating customers, I think we've got to up the level because that's what people expect. We've just moved to the Olympic Village in Stratford, near the London Stadium: I just think the offer was was not right, and I could see people parting with good money that they've worked hard for, and expecting more. Craft beers, too there should be better beers available. I remember when the Emirates first opened, I was so gutted. It was easy, you didn't have to queue up for a beer, you could get really good food. And I'm so, so happy now that we're going to give Raymond Blanc a run for his money. I'm delighted, and I'm delighted especially for Tottenham Hotspur.